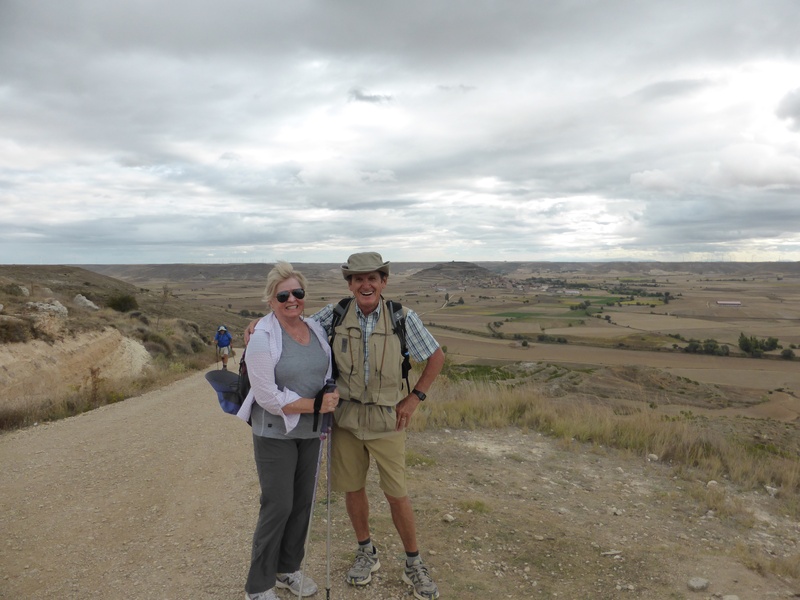 Look way across the valley – see the town at the bottom of the large hill on the horizon – that is Castrojeriz, and it took us only 90 min to get the 7 km up almost 900 feet to where we are on the Meseta plains. Our last few kms before leaving Castile for the province of Palencia – the fourth province we visited. This was unusual…. Yes for those who have lived on the prairies, that is a grain elevator and the first one we have ( ever!) seen in Europe. 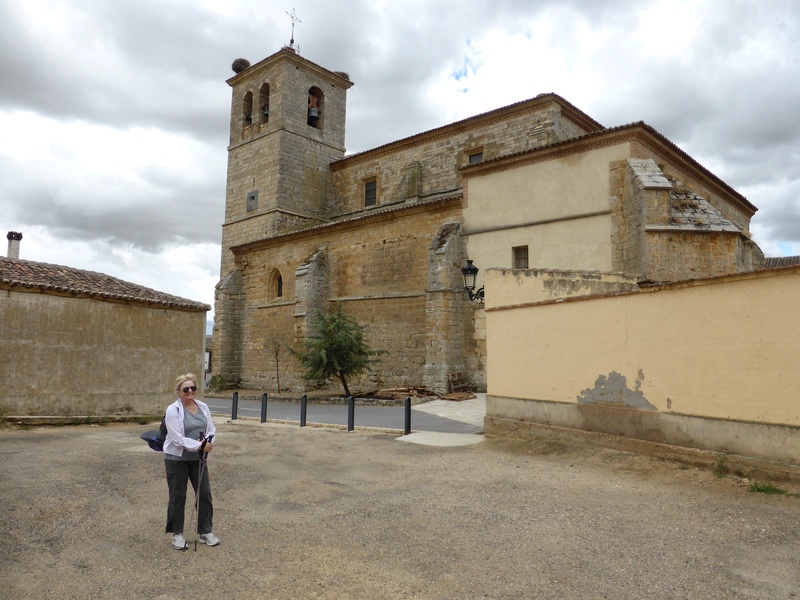 Our destination the church at Boadilla del Camino, some 360 km from our start 25 days ago. We climbed 800 foot sidehills, avoided some thunderstorms and descended into valleys carved by the water erosion from the mountains to the south. From here next year we have a level trek for five days before getting into some serious vertical routes. 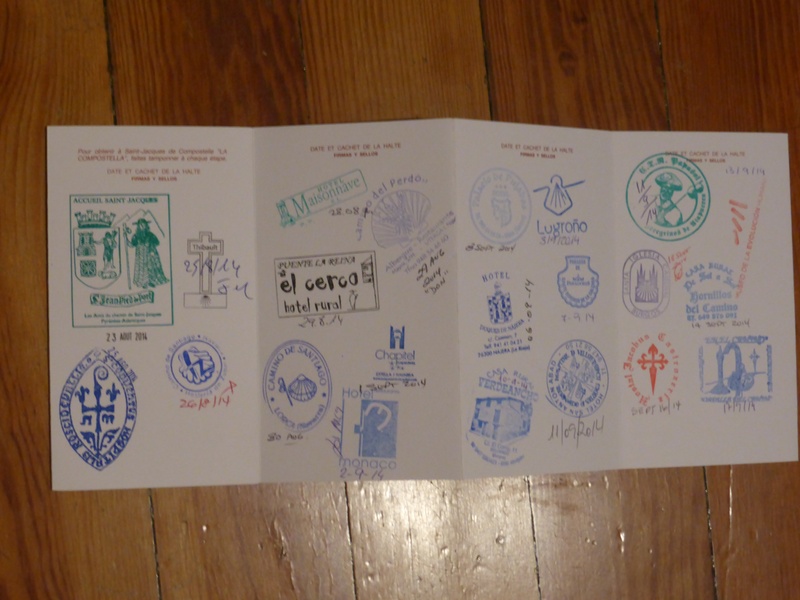 Sadly the church was closed but we were able to get our Camino Passports stamped at the nearby auberge. Interesting comment that Rod heard while there ” wow, a shower, my first in two weeks” . Pilgrims are willing to do without. Those are our Camino passports. Every day we would find some special place that would certify our passing. Next year that passport, when completed, will allow us to be awarded the a compostela, a certificate of completion of the pilgrimage. 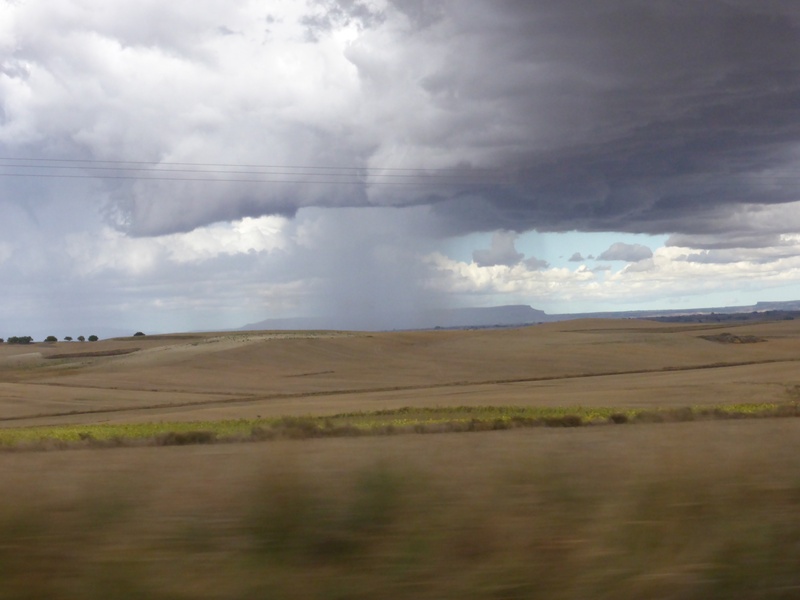 After being on the Camino for 25 days, this is the closest we got to rain!! During the summer time, it is interesting that almost 50% of the rainfall is from thunderstorms on this prairie region. Picture taken from our cab window as we retraced our steps back to Burgos for the train to Madrid. What had taken us 3 days to walk we made by car in less than 90 minutes. As we watched the familiar places whiz by, we realized how fortunate we were to have experienced this journey “at the speed of life”. 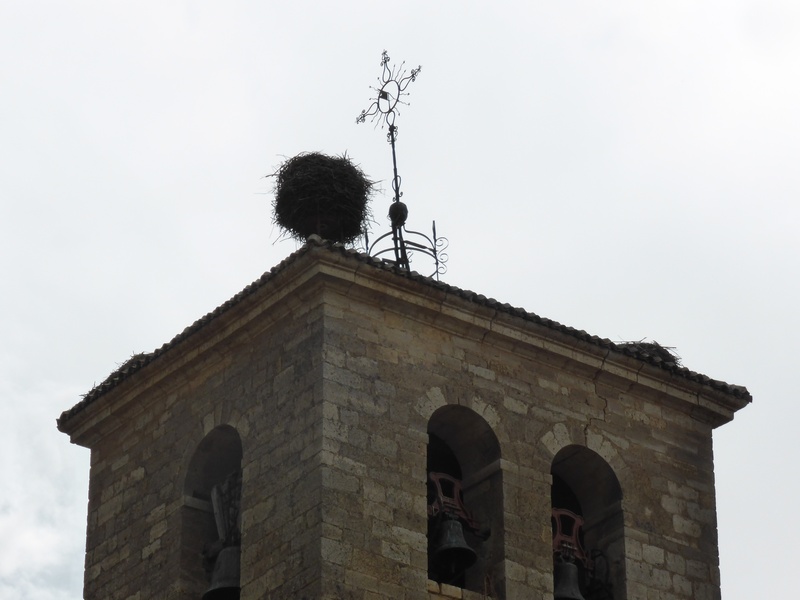 That’s a stork’s nest on the top of our destination church. Go back to the picture of the church and you will see it at the top of the building. Preparing to depart for Boadilla this morning we could not believe in a few hours we would be finished our Camino for this year. Despite some days of walking that seemed endless it has been a great journey and has passed quickly. Castrojeriz did not phase us. About 2/3 of the way up the bright yellow emergency vehicle was taking a cyclist and his bike off the hill. We don’t know what the problem was. It could be just a bike breakdown. The descent from Alto was difficult but then the land levelled out and remained that way for the rest of our walk. Dark storm clouds were overhead and we did hear a bit of thunder. Fortunately, the rain held off until we arrived in Boadilla:-) We have been incredibly lucky with the weather! Despite a strong head wind we made good time. Now we are back in Burgos. (Our transportation from Boadilla was right on time). Some of the very old houses in Boadilla are built on stilts with an enclosed space underneath in which logs are burned thus heating the floors. This was another Roman invention. 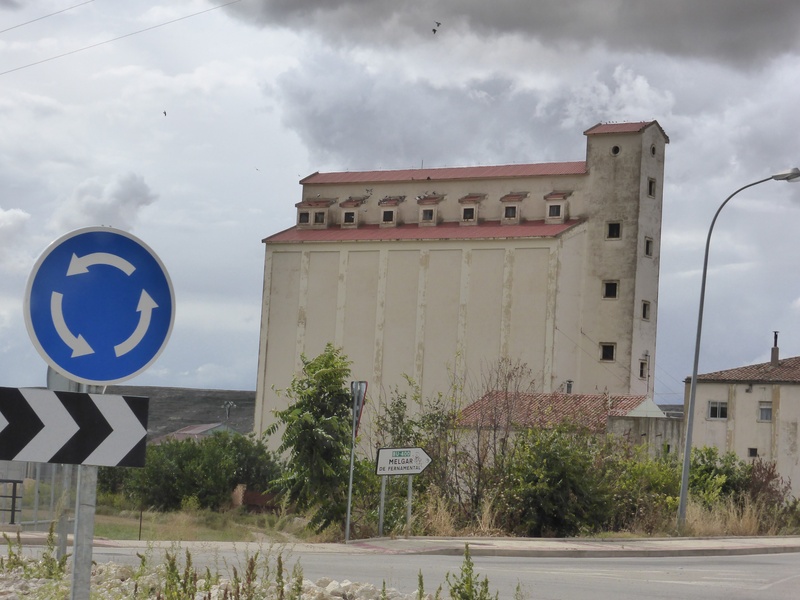 Boadilla is also a part if the Canal of Castilia, one of Spain’s greatest engineering feats. This canal is 207 km long and has a lock system. It began in the 18th century and took 70 years to complete. Originally it was built to transport grain but the advent of the railway in the 19th century was more efficient. We are very happy to have reached our goal of 360 km of the Camino for this year. It may sound strange but we know we will miss it. Walking the Camino de Santiago de Compostele is an incredible personal experience. We feel fortunate that we are able to do it. It is difficult to explain or express the feelings you have walking the Camino. Certainly, many days it was a physical challenge to us. We are grateful that out first half of the walk went well. How Mutti’ s head and leg would be able to tolerate the physical aspects of our walk was an unknown when we began. In the past month she feels her leg is stronger and only the hottest day’s bothered her head. The Camino is more than a long walk. It is an emotional experience as well. Among pilgrims of the Camino there is a saying, “Everyone walks their own Camino”. We are all following the same footsteps but the effect the Camino has on each pilgrim is unique to them. However, to put our walk into perspective: In 1980 a Canadian young man with one leg ran 5,373 km in 143 days to help others….. Thank you for slogging through the blog:-) It has taken us a day or so to put it to rest until next year. We are sending this from Santorini, Greece where we are giving our feet a rest. Congratulations to you both….loved your writings and the trip along with you.